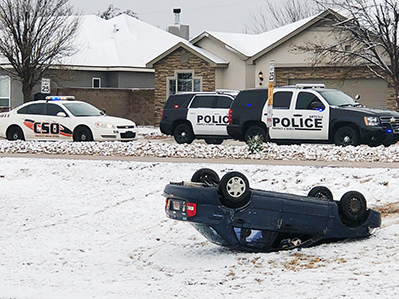 Saturday’s brief blast of winter weather thwarted a local teen, whose vehicle skidded off the road and flipped into Eagle Draw along Mahone Drive. Artesia Police Department officers were dispatched just before 9 a.m. Saturday to the area of Mahone and Centennial Drive in reference to the wreck. According to Cmdr. Lindell Smith, the 16-year-old driver was unable to negotiate the curve. He was cited for careless driving but fortunately suffered no apparent injuries.